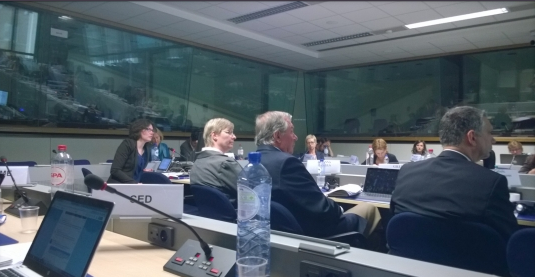 On 17 June, CED Head of Office Nina Bernot and CED Senior Policy officer Sara Roda attended the Commission Expert Group on European Health Workforce. The objective of this meeting was to follow-up on the progress made on the Commission Action Plan for EU health workforce since its launch in 2012 and to have a first discussion on the sustainability of the Joint Action on Health Workforce Planning and Forecasting (JAHWF). Further discussions on this topic will take place in Varna, Bulgaria, in November in a workshop organised by the JAHWF. The Commission also reported on the results of its survey on continuous professional development (CPD), carried out to identify topics for information exchange on CPD. The most popular topics identified by the Commission were the impact of CPD on better patient outcomes and quality of care, and barriers and incentives to CPD. The Group agreed to hold at least two sessions to exchange best practices in this regard. Foreseen for autumn of this year, the first session should focus at CPD in patient safety outcomes. The second session should be scheduled for the beginning of 2016 and the decision on whether to address barriers and incentives to CPD will be made in autumn. The Commission-funded study to map effective retention and recruitment strategies for health workers was presented (the study findings will be published in the week of 6 July) as well as the OECD preliminary results of the 2015 data collection on health workforce migration. These results will allow better policy making once concluded. An update of the Commission study on core competences for healthcare assistants, which started in March 2015, was also provided. Results are due in the autumn of 2016. The next meeting of the Expert Group is being planned for 16 November.